This module is based on the 2nd generation AMD Embedded G-Series SOC (System-on-Chip) processors. Compared to the current AMD Embedded G-Series SOC platform, they provide higher performance and a lower power draw thanks to an improved Jaguar+ CPU architecture and AMD Radeon(tm) 8000 graphics core. ARBOR Technology, a leading provider of embedded computing solutions, is expanding its successful line of modules with the introduction of a 6th generation Intel(r) Core(tm) processor platform (codename: Skylake-U). The EmETXe-i89U0, a Type 6 Compact module features the Skylake-U single-chip processor which has a low power consumption of just 15W TDP. ARBOR Technology, a leading IPC provider of embedded computing solutions, announces the release of the ARBOR EmETXe-i87M2 COM Express Type 6 Module with ECC Memory socket support. The module is based on the new Intel(r) 5th Generation Core(tm) processors (formerly codenamed "Broadwell"). 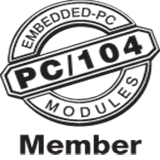 ARBOR Technology, a leading IPC provider of embedded computing solutions, announces the release of Arbor Em104-i230F PC/104 SBC Module. The SBC module is based on the new Intel(r) Atom(tm) processors E3800 family (formerly codenamed "Bay Trail"). ARBOR Technology is expanding its successful line of modules with the introduction of a 5th generation Intel(r) Core(tm) processor platform, the EmETXe-i88U0, a Type 6 Compact module. With the upgraded performance improvement, rich I/O and connectivity, and extensive data collection capabilities, the G1052C is perfect for highly mobile applications such as warehousing, logistics and mobile point-of-sale.